The Edge got redesigned for 2019, but the big news is the new ST trim to satisfy peoples insatiable stupid crossover performance needs. Starting at $41,200, the ST comes standard with the 2.7 liter turbo V6 (with start stop tech) putting out a not too shabby 335 horses and a what the hell torque rating of 380 ft/lbs of torque through an AWD system though an 8 speed auto. It also comes with a sport mode with paddle shiffters. 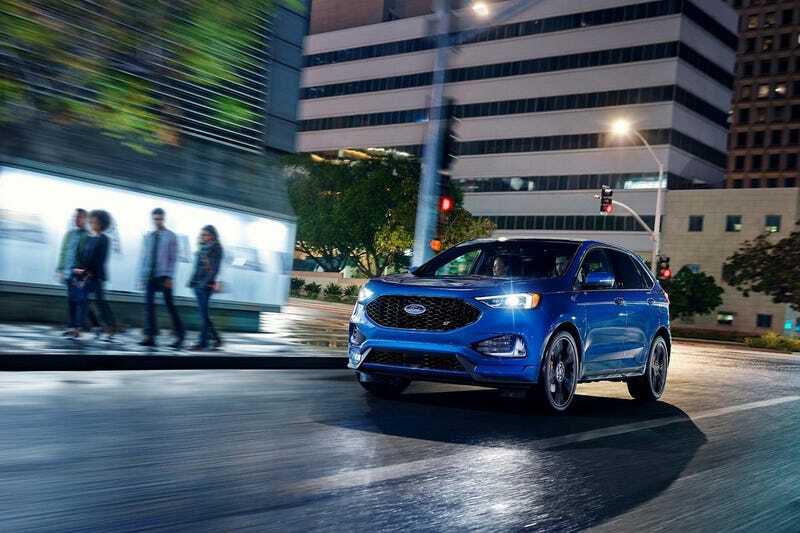 It actually changes engine response, changes the cluster and has the terrible, terrible trend of enhancing engine sound, aka pumping engine noise into the cabin artificially, which Ford describes as: enhanced active noise control provides a more engaging sound in the cabin. Sad. There are 6 exterior color choices, 2 of which are extra: a $395 Ruby Red metallic and a $595 White Platinum, which can be described as the color of choice for upper middle class seniors on their crossovers. Surprisingly, the good looking blue hue that the ST debuted in, called Ford Performance Blue, isn’t an extra charge option. Also of note here is the fact that selecting the summer tires deletes the spare and replaces it with an inflation kit with sealant. You cant select all 3 of these either. Selecting the Convenience or Co Pilot assist package requires removing the 401A package for some reason. So I just selecting the brake package. Interior packages are only 2: a cargo accessory package for $290 with a cargo mat and cover and a rear bumper protector and a $495 cold weather package that includes front and rear floor liners, a heated steering wheel and a windshield wiper de-icer. There are 2 wheel design options as well. A standard 20 in aluminum wheel and a 21 inch wheel that comes with the performance brake package. Honestly the car comes pretty loaded with this pretty much being the king of the Edge line hill. It even comes with a pano roof. The big main stand alone option is a $1,995 rear seat entertainment system that I honestly don’t understand why it keeps being offered.